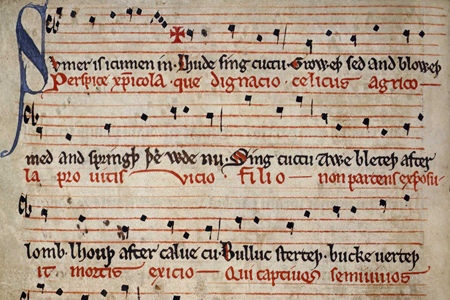 This 800-year-old song comes from a miscellany that was probably written in Oxford around 1260 and it's the first recorded use of six-part polyphony. The beautifully preserved manuscript contains poems, fables and medical texts – and is the only written record of ‘Sumer is icumen in’. The song is a ‘rota’ or round, a canon for several voices (in this case six). It describes the coming spring, a singing cuckoo and various excited farm animals. Click the image below for a closer look at the full manuscript in all its glory. First, there are both English lyrics and completely different Latin lyrics. Below the musical staff you can see the lyrics printed in Middle English (black) and Latin (red). It's the first composition known to have used six-part polyphony – ie six voices singing independent lines. The Middle English contains several words that are recognisable, although one phrase will need a little explanation. ‘Bucke uerteth’ apparently means, ‘the goat farts’, and is said to be the first usage of this mild profanity in written English. 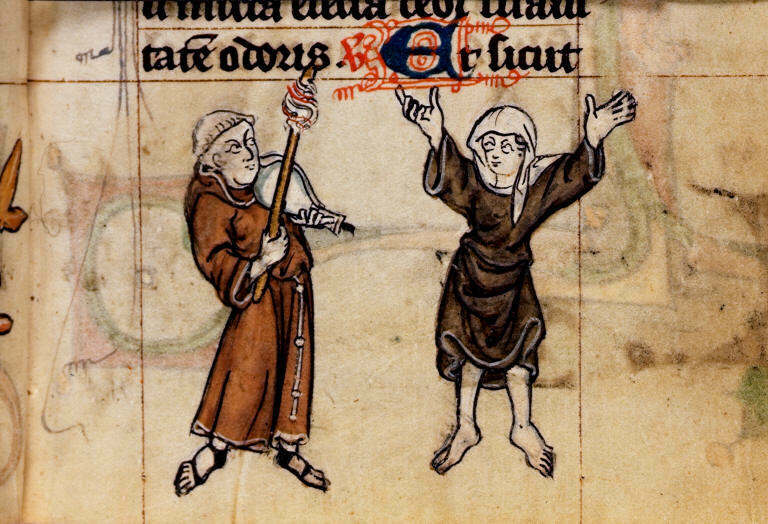 The man who owned the manuscript also led what you might call a colourful life: William of Winchester, a monk from Reading who might have owned the manuscript, loved music and women. Which was problematic given his vocation. He was brought before the Bishop of Hereford in the 1270s following allegations that he had slept with a number of women, including a nun. What does the red cross mean? This version is sung by the Hilliard Ensemble. But what are those odd-sounding lyrics and what do they mean? Here's a translation by the British Library. Look, O lover of Christ, what condescension! The heavenly husbandman, because of a fault in the vine, not sparing his son, exposed him to the ordeal of death; and he brings back the half-dead prisoners from torment to life, and crowns them with himself on the throne of heaven.